While ice fishing may seem like the proverbial lone soul sitting on a bucket waiting for a fish to bite, there's much more to this hard water sport. Here are a few good tips. Be Mobile - as a general rule all gamefish go from shallow in the morning, to deep and back to shallow again in the evening. It's a migration pattern that puts them up shallow and in close feeding when the light is low. It pays to fish this way, starting shallow in the low light periods and going deeper as the day progresses. Choose Your Location Wisely - For daytime walleye action, I can't beat fishing the deeper edges of drops. Especially so on a cloudy day when the bite can go long into the day. When it comes to trout, I would be hard pressed to find a better place than the deep edge of an underwater weedline. 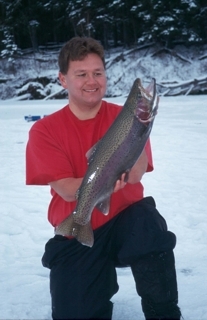 Typically this is found in 7 - 10 feet of water and will offer up cruising trout all day long. Lighten the Load - If you're getting bites, but the fish are dropping the bait or you're simply missing the fish on the strike, quite often the solution will be to go lighter. Put down a lighter jig, or perhaps put bait on all by itself and let it sink at its own rate down to the bottom. The lighter and more natural a bait, the more fish will pick it up and hold it, giving you or I the time to hustle over and set the hook. 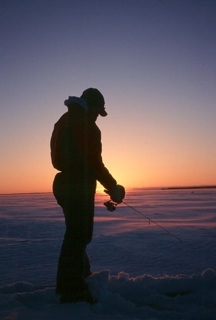 Pick the Long Rod - If you are jigging or using a setline outside of a tent, swap in the short ice fishing rod to the longer, and more conventional summer rod. They do a much better job at setting the hook, holding the fish throughout the fight, especially with barbless hooks in effect and they can also serve as a good strike indicator when propped up as a setline. The shorter rods are good inside an ice-fishing tent, which comes in handy sometimes, but for outside use, the long rod is unbeatable. These are a few of many ice fishing tips that will help you connect with and land more fish. Have a great March. Enjoy the warmth of the sun and may you have fun and catch a big fish.